- going to a known haunted place and recording data (video, photos, audio, temperatures), notes, interviews and other evidence to prove/disprove the haunting and to assist the owners and the spirits in moving on and leaving the place if they want that. The assistance can be either you directly assisting the owner with the situation or putting them in contact with experienced groups or individuals that will try to resolve the situation. Your assistance can be something as simple as educating them on what is going on and their options. types of spirits you may encounter. One was a human at one time and it has remained on this level for some reason. It may not know it's dead, may be held here by unfinished business, guilt, etc. These spirits are like the person was when they were alive, so they could be good or bad, just like the living, but not normally dangerous. This human spirit is the type you will encounter 95% of the time. You could also witness a residual haunting which is just a playback of a past event. This is just like watching a video from the past playing over and over. The other type of spirit you may encounter were never human and are generally bad news. You must be aware of this type but not obsessed with them, the chances that you will encounter them in a regular ghost hunt are slim. I have experienced both types and I just want to make you aware of their existence. So be aware and protect yourself and you should have no problem. Look for no trespassing signs. Make sure you are not trespassing. If you are on private property you are risking getting a ticket or arrested in some areas. You can get permission from many owners and or caretakers. We will often notify the local Police that we will be in a grave yard "taking pictures" so they are aware of our presence. If you are asked to leave do so immediately, you will not win this argument and you make other investigators look bad if you make a scene. Make sure you bring you ID. (drivers license, etc.) so if you are questioned by the police you can prove who you are. The best times are from 9pm to 6am, these are the psychic hours, but anytime can produce results. Photos have historically been better in the dark but don't let that discourage you from taking them during the day. Some of my best photographs I took in the day. * 35mm Camera - Nothing fancy with at least 400 speed film. 800 speed film is also good at night but you'll have to test your cameras flash strength to see which speed works best for you. Even those single use 35mm cameras have gotten good results. If you are more experienced photographer you may want to try infrared film. I have seen results from Polaroids but I suggest you only use these along with a 35 mm camera so you can compare the results. I have used Fuji film primarily but I have also used Kodak and a department store brands with similar results. When you develop them you don't need to go to a camera shop, the local drug store or department store is fine. Let them know you want all the pictures developed so that you get the pictures that they might think are bad ones. These "bad ones" are normally your best ectoplasm mist photos. * Digital Camera - Regardless of what you've heard digital cameras are great tools for ghost researchers. Once upon a time they had their limitations and problems but that is no longer the case. Not only do they allow you to see instantly if you have a positive photo, they can also take photos in limited infrared range of light. * Flashlight w/ spare batteries - a common sense item. Remember to bring spare batteries for everything. Due to spirit activity, batteries often run down very fast and you don't want to miss anything because of dead batteries. I recommend using a red lens flash light to help preserve your night vision. * Notebook w/ pens and pencils- you need to write and log in everything that happens. If you don't then you really don't have much research information. An example of this is one investigator gets a EMF reading that's high and never writes it down. 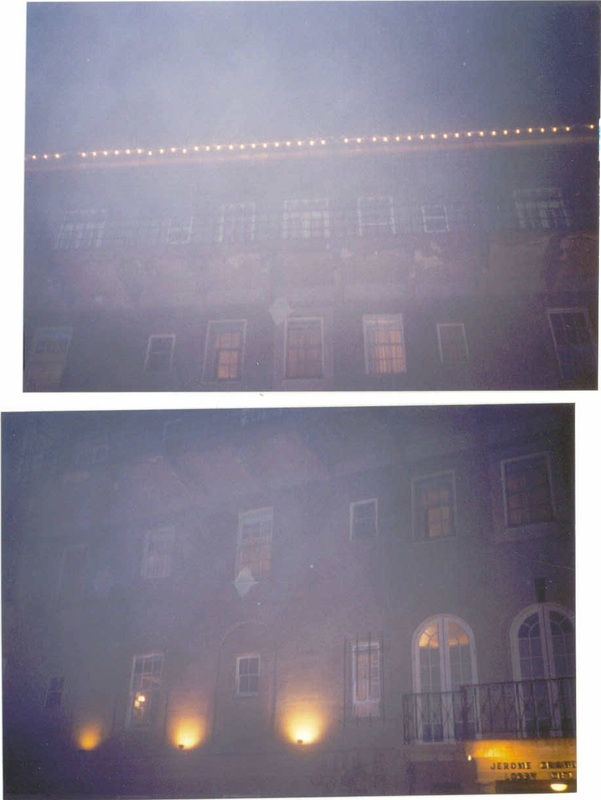 Another investigator takes a picture of the same area but is not aware of the reading and gets a anomalous image. Without that EMF reading the picture may be good evidence, but with a report noting the reading, the picture greatly increases in evidence value. Many investigators use a pocket tape recorder in stead and that is fine, just make sure you have spare batteries and tapes. * Video camera (optional tripod) - Video cameras are an important instrument for an investigation. Unlike still cameras they provide us with constant visual and audio surveillance for review and observation. The video cameras we use are equipped with infrared capability and this is the mode we use. With video any phenomena occurring can be documented in its entirety. This will show the length of time the phenomena occurs, what is happening, the conditions surrounding the phenomena, and possibly even the cause of the phenomena.. The Sony line of camcorders has an infrared night shot feature that enables you to video tape in complete darkness and see beyond what the human eye can see. You can use these on tripods or walk around with them. You should also invest in an infrared light extender which will help your camera see in the darkest places and make the quality of the video better. electronic voice phenomena (EVP). You have to use a external microphone when recording EVPs (ghosts voices). If you rely on the internal microphone you will also be recording the internal gears and motors and this will make your tape worthless. Any sound you hear on the tape could not be used as evidence because of this, so use the external mic, they are pretty inexpensive. The type of tape that is most often recommended is high bias tapes or metal tapes. * Digital audio recorders - This recorder is small and easy to carry. You can also use the voice activation feature so there is less audio to review. I use this for my notes as well. Most units record the time of the recording as well which is very useful. When using audio recorders be sure to state the location, time of investigation, and investigators names. When recording investigators names it would be wise to have each individual present state their own names, which will make it easier for distinction amongst voices heard on the tape during review. Voice activation mode should be deactivated on tape recorders during use when electronic voice phenomena is trying to be achieved due to the fact that it usually cuts off beginnings of words, sentences, and phrases. This is not necessary with digital recorders and they actual seem to work better in voice activation mode. SJGR training sheet I give all my new trainees on EMF meters. * Hand Held Radios - Or Walkie Talkies are very useful in a large outdoor area and a building with groups spread out in various rooms. They could be great in emergency situations or just to rotate groups. Be sure to be aware they could interfere with your EVP recording though. 2. Enter the site and either privately or as a group ask for blessing or protection for the duration of the hunt. YOu can use this time to put yourself in a positive frame of mind. It does not have to be a religious thing so everyone can do this in some way. I do encourage everyone to take the 10 seconds this takes and do this. What can it hurt? It's better to be safe than sorry. Many experienced groups believe that there are evil spirits in many areas such as cemeteries and by saying a 10 second prayer or making sure you are in a positive frame of mind you can safely go about your business without worrying about them. An experienced demonologist will tell you that by doing this in the name of God or whatever good deity you worship, you will keep any non human spirits at bay since they have to leave you alone when told so in this manner. The prayers I use are found here. weather conditions and any other relevant information. You can also begin to set up any stationary equipment like camera on tripods or motion detectors. Make note of any areas that may cause you to get false readings or false positive pictures. For 35mm cameras ; Open your film and load your camera after walking around the location for about 20 minutes first. * For 35mm cameras ; Use at least 400 speed 35 mm film. 400 and 800 speeds work the best. Black and White film also works well. * For 35mm cameras ; If you are an experienced photographer, you may want to try infrared film which also has had excellent results in the past. * Don't bother with your cameras viewfinder. Hold the camera out in front of you and aim at the area you want to take a picture of. Many newer digital cameras do not even come with view finders. This also helps in cold weather by keeping your camera away from your breath. orb, mist or sparkles in your flash or others flashes, take more pictures right there, you may be near a spirit. * Cemeteries - The age of the cemetery doesn't matter but the older it is, the more time it has had to accumulate restless spirits. Why cemeteries? Well there are theories such as they are portals to the other side or that some spirits are drawn to their former bodies. * Schools - Schools and former sites of schools may have the build up of psychic energies and imprints of all the highly emotional events that have transpired there. * Theaters - The actors have run the gambit of human emotions inside the walls of a theater plus many have interesting hauntings attached to them. * Battlefields - These are great locations simply because of their nature. Many violent deaths in one area will always hold some spirits and psychic energy there. * Churches - There is a long history of the faithful returning to the church they worshipped at. They may be looking for the salvation they were promised and cannot find. * Hotels/Motels/Boarding houses - Many dark dealing and highly emotional events take places in these rooms. * Historic Locations - Many historic buildings, because of their age, have had more time to have spirits attach to it. These buildings are often open the public and can give you a easy place to start. Many even have known histories of hauntings and you may be able to gain access to the building after hours after speaking with the caretakers. * Books on Local Haunted Places - This what I used at first to get into some places. They let an author publish the fact the place is haunted so there is a chance they may allow you in to take a look. If it is is raining, snowing or foggy and you are scheduled to do an out door ghost hunt, reschedule it. You cannot conduct a proper investigation in these conditions. * Keep an open mind, any negative feelings may drive the spirits away. Be respectful of the locations and the dead. * Be skeptical, look for causes for any phenomenon such as natural or man made causes. As an investigator you have to make sure your final evidence will stand up to scrutiny. By eliminating all other explanations, your evidence becomes stronger proof. * No smoking, alcohol or drugs at an investigation for mostly obvious reasons. * No whispering, it can taint your recording results. * The Tax Assessors Office can give you historical info on many locations you visit. * Do not wear perfume, cologne or anything else with a very noticeable scent. This is so someone does not mistake the smell for a supernatural occurrence. Spirits often use scents and smells to get our attention. * Make sure you let someone know where you will be so they will know in case of emergency. Keep in mind that many of the people who will request an investigation will want to be comforted, educated and they may even want the spirits to leave. Whatever your approach or beliefs, be prepared for this and if you are not willing or cannot help the people in the way they would like, at least provide them with names of people who may help them. Also try to educate them so they understand what is occurring. After explaining what is happening to a witness, many will no longer be frightened or as concerned and you will have done them a great service. If you are a person or group that does offer more assistance through psychics, spirit rescues, etc. remember that the well being and the feelings of the living come first.